My Home and Garden: Bright pink flowered strawberries. This year, there they were again. I couldn't help myself. I took a little one in a little pot. Sister Jess talked me into taking this one. A larger pot with 4 or 5 plants in it. I thought, what the heck, and put it in my cart. What I didn't know was that she planned to buy my plant choices for me. Isn't she amazing. 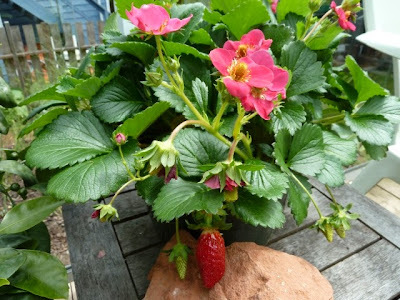 So last night, the first strawberry turned red. Allan and I decided to pick it and share it for dessert. I cut it in half and we deemed it, a very passable strawberry. It was good. I'm glad, cuz they sure are pretty. Very pretty! Such a nice shade of pink! It really is the prettiest pink. I love it. I have decided to move it into a larger pot later and keep it where I can see it rather than garden planting. True!! It sets the berries and they ripen MUCH faster than my planted out strawberries. The blooms are beautiful. Wow. How blessed to have such a good and thoughtful sister. Not a day goes by that I don't think of my great good luck...to be born into the same family as my sister. She is such an incredible joy in my life.